Walking before or after meals promotes healthy metabolic activity, but walking before the body has ingested food enacts different chemical reactions than walking after the body has begun digesting the food. No matter whether you decide to walk before or after a meal, whenever you participate in physical activity appropriate for your age and condition you are enhancing your overall health. Walking within a half hour or so of eating a meal decreases the amount of sugar and fats that accumulate in the blood after eating, especially when they originate from foods high in protein or carbohydrates. Physical activity also stimulates your metabolism, which burns energy and calories. According to a 2006 study published in "Applied Physiology, Nutrition, and Metabolism," people who walked prior to putting any food in their stomach and who walked hard enough to perspire burned more fat than those who walked after eating. When you engage in any moderate to rigorous activity, appetite tends to immediately diminish due to elevation in body temperature. When the body is warmer than normal, it concentrates on lowering that temperature to maintain homeostasis. Appetite and digestion temporarily are pushed aside until the body is no longer stressed by heat. However, once you are cooler, appetite returns. So if you are trying to lose weight, walking before a meal might help reduce your intake of food, especially if your walk produces a significant increase in internal temperature. 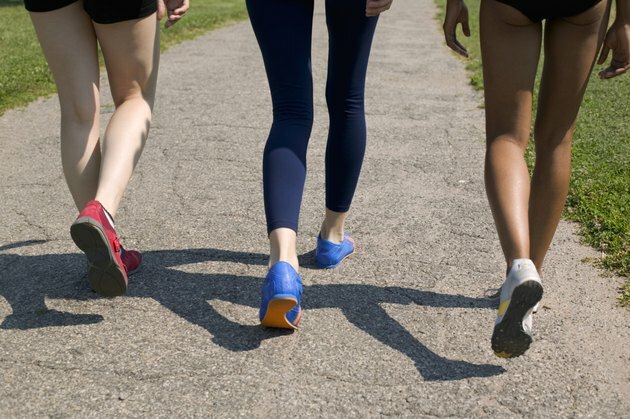 Depending on how much food you consume, engaging in light or moderate walking is an excellent way to rev up that metabolism and burn off those calories, as well as contribute to muscle and heart health. However, brisk walking is not suggested after consuming a heavy meal because the body is trying to digest a large mass of food while vigorously walking at the same time. This causes the blood supply to overextend itself, which forces the heart to perform at twice its rate. Wait about 45 minutes to an hour to walk after big meals. People who have trouble falling asleep might benefit from taking a walk after the evening meal. This is because the chemicals needed to induce sleep are byproducts of metabolism activity, especially when sugar is burned for energy. So the more sugar utilized in performing physical activity, the more of these sleep chemicals are produced. In addition, light activity like walking also has proved to lessen or even eliminate evening food cravings. Can I Tone My Stomach by Walking? How Much Will I Lose in One Month if I Walk 6 Miles Every Day & Diet? Does Walking Speed Up Labor?